As you know from Monday’s review, I recently returned from Ontario, Canada and of course sampled cupcakes from different bakeries while I was there. While I did not research cupcakeries in Toronto very thoroughly, I did plenty of research on cupcake shops in an area called Hamilton, located about 20 minutes from our Cottage by the Lake. I had already narrowed my options down to about four shops, when I saw “The great cupcake taste test” from the Hamilton Spectator. Knowing that I wasn’t going to be able to visit all four, I was more than happy to have this guide to go by and decided on my final two choices: Cupcakes of Westdale Village (voted best Chocolate/Chocolate) and Beyond the Batter Cupcakes (voted best Vanilla/Vanilla). Normally, I don’t tend to purchase the classic flavors. You could say I’m a risk taker when it comes to cupcakes. But, since they were voted the best in each category I knew I had to try each of them. I decided that I would also get a fun flavor of my choice when I was there, just to keep things interesting. 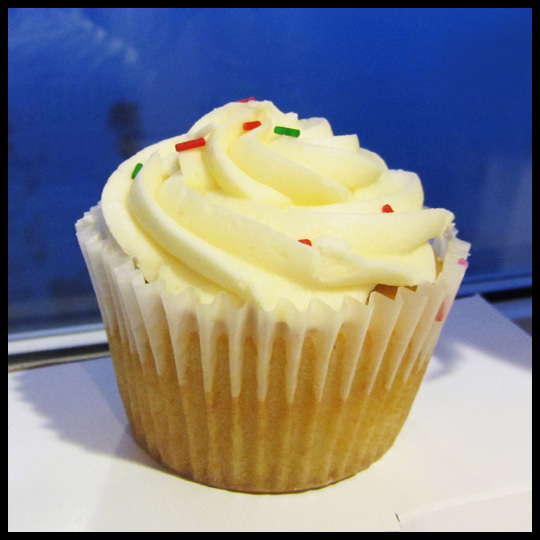 In part one of this review, I shared my visit to Cupcakes of Westdale Village. 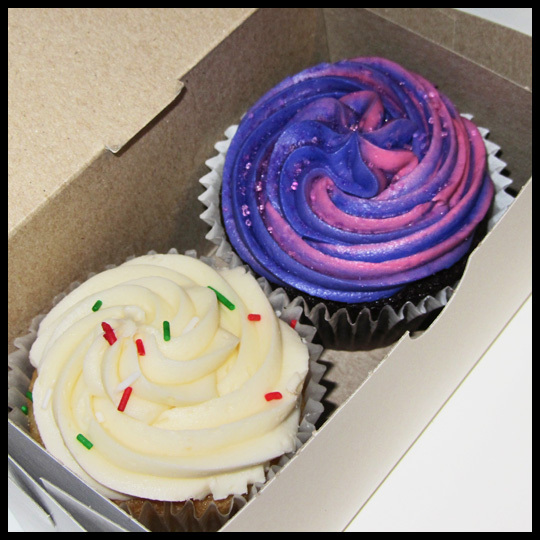 Today, I will share my review from Beyond the Batter Cupcakes. While Beyond the Batter is not actually located in Hamilton – it is located just outside of it in a town called, Stoney Creek – since they were reviewed by the Hamilton Spectator and voted as having the best Vanilla/Vanilla cupcake in Hamilton, I’ve left the “Hamilton” reference in the title. Beyond the Batter was actually a little tricky to find. Their storefront is hard to see from the street, with a tree in front of it and nothing other than their store front window advertising “Cupcakes.” But after passing it, turning around, and coming back, I was finally there. Once inside, I was pleasantly pleased by the understated simple decor. 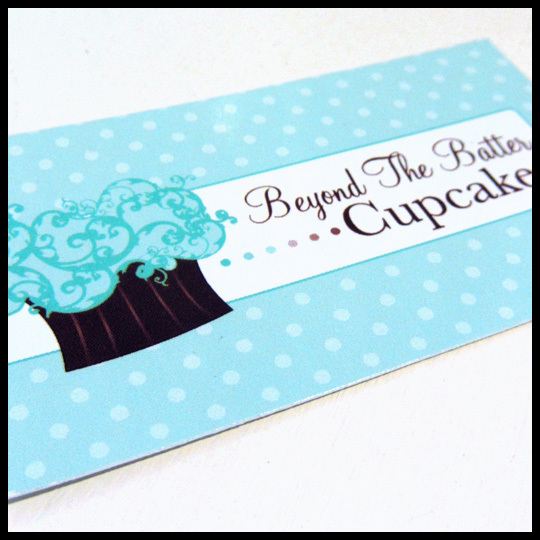 The walls are painted in the same pretty “Tiffany” blue that is used on their website, business cards, and cupcake boxes. I love their cupcake illustration for their logo that adorns their cards and boxes. It’s vibrant and whimsical, just like cupcakes. Like Cupcakes of Westdale Village, Beyond the Batter displays their cupcakes in simple cake stands, however, their’s are made of glass and they have a variety of different ones. They also have charming hand-written signs for describing what flavors are contained. The combination of the two keeps with the playfulness seen in their logo. Since Vanilla/Vanilla was voted the best cupcake, I knew I was getting that one. 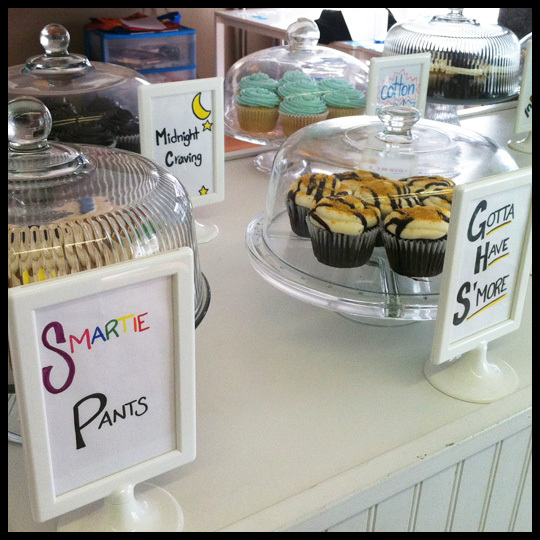 I had read and seen photos of their Nerd Alert cupcake, but unfortunately they didn’t have any that day. (Major bummer). I guess on my next trip to Ontario, I’ll have to give them a heads up that I’ll be there and see if they which days they will have this flavor available. If you’ve already visited their website you may have seen that for the month of November, Beyond the Batter is donating $2 from one of their special cupcakes to families with sick children who are struggling financially. This cupcake is named Taya’s Cupcake after a four year old girl who passes away from a brain tumor. After reading this, I knew that was the second cupcake flavor I was going to get. So, with all my cupcakes in tow, I made my way back to our cottage. The first I decided try was Taya’s Cupcake (chocolate cake with vanilla frosting). 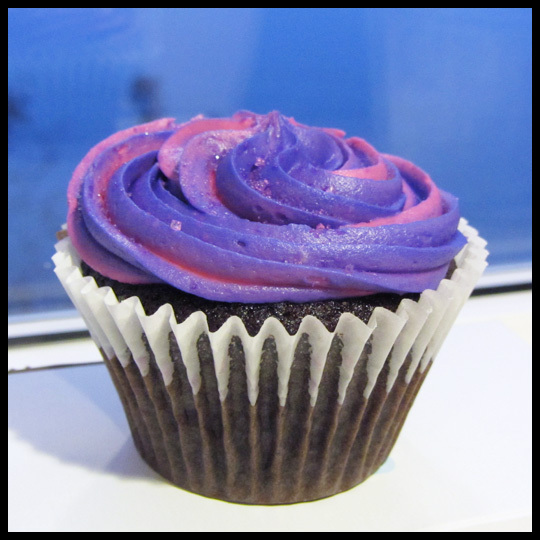 This cupcake was vibrant with the bold frosting colors swirled together. I really wanted to love this cupcake, but unfortunately, did not. The chocolate cake was only okay compared to Cupcakes of Westdale Village’s chocolate cake, and the frosting, while fun, tasted strongly of food coloring. It hurts me to say that since this cupcake is for such a great cause, but I honestly can’t say that it was a good cupcake. However, if you are the person at birthday parties who claims the bright colored flowers on the birthday cake as your own, then this cupcake is made for you. But unfortunately, it didn’t work for me. That said, I wasn’t sorry I bough this cupcake since $2 went to such a great cause and I think that any child would love this cupcake with all it’s sugary wonderfulness. It just wasn’t for me. So, on to the Vanilla/Vanilla. I had BIG expectations from this cupcake since it was voted “best Vanilla/Vanilla” in Hamilton, but I really can’t claim to be an expert on this flavor since I very rarely order it. That said, this cupcake was heavenly. I think it may have been the best vanilla cupcake I’ve ever tried. Their Vanilla/Vanilla makes me want to try other cupcakeries vanilla, just to see how it compares. So, while Taya’s Cupcake may have missed the mark for me, this was right on target. They also had a salted caramel on the menu. I’m still kicking myself for not getting that one too. At the time, I was proud that I stuck with my “2 cupcake rule,” but looking back, I really should have gotten it. 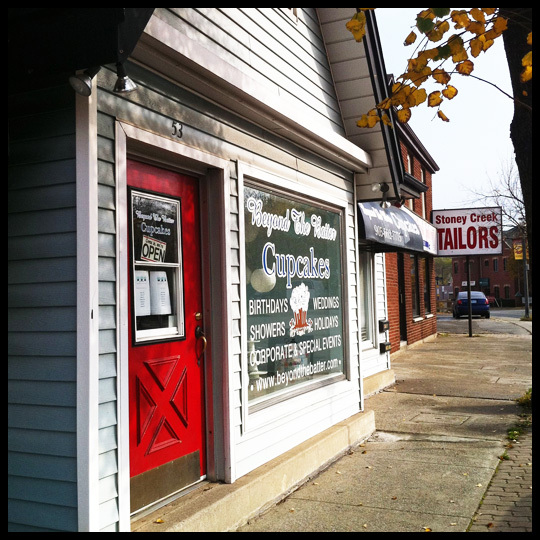 Overall my experience with Beyond the Batter and Cupcakes of Westdale Village were both really wonderful. I got out and explored Ontario a little more than I may have if it wasn’t for them, and I got to see first hand that Ontario has a great handle on the cupcake craze. I’m looking forward to going back and hope to stop by each of these locations again. Also, these visits made me appreciate the classic flavors more than I once did and I think from now on, I’ll be sure to order a classic mixed in with all the wild and crazy flavors I tend to purchase. This entry was posted in Canada, Cupcakes, Ontario and tagged Beyond the Batter, Canada, Cupcake, Ontario, Tour by Stacy. Bookmark the permalink. That’s cool that this trip gave you a new appreciation for the classics, but no need to kick yourself becasue I’m gonna kick you for my getting the S’mores cupcake! ;P After seeing that and the Midnight Craving, I don’t know how you just stuck to the two. And what was the Smartie Pants? Sounds VERY interesting!